Financial decisions aren’t really about money. They're decisions about how we spend our lives. When most financial professionals talk about planning, however, they focus on numbers and technical details. Enter The One-Page Financial Plan. Too often, the complexity of the planning process paralyzes people before they even begin. Carl Richards sweeps away that complexity and reframes these discussions to focus on the things that actually matter to real people. Rather than identifying arbitrary and impersonal goals (such as trying to beat the market or knowing exactly how much money you’ll earn years from now), he empowers readers to identify the goals that align with their values. Through a series of steps, he shows readers how simple these decisions can beonce readers are clear about what matters most. 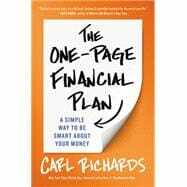 Based on Richards’s twenty-plus years of working with clients, The One-Page Financial Plan refocuses readers away from useless financial plans and on the incredibly helpful process of true financial planning. Using his popular sketches that break down big concepts into easy-to-remember visuals, the book is a provocative, even fun, exercise that moves people toward the lives they want. CARL RICHARDS is a certified financial planner, author of The Behavior Gap, and the director of Investor Education for The BAM Alliance. His column, The Sketch Guy,” runs weekly on The New York Times Web site, and he is a columnist for Motley Fool and Morningstar Magazine. He speaks frequently worlwide at financial planning conferences. He lives in Park City, Utah.